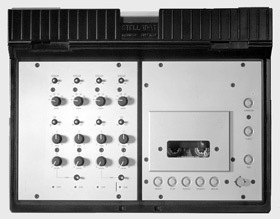 STELLADAT II is the unique 2 and 4 tracks DAT portable tape recorder. While other manufacturers are making their DAT machines cheaper rather than better, SONOSAX has been working to achieve manufacturing efficiencies while providing a better product with more features. STELLADAT II maintains of course the standard of quality and dependability that customers have learned to expect from Swiss manufacturers. STELLADAT II is extremely advanced in its features and design. It has four mic/line inputs, all with high quality mic preamplifiers, input gain control, limiters, low pass filters, pan pots and output level controls. These four inputs can be routed to two or four tracks, with or without pan pot, depending on the applications (see the audio routing table). STELLADAT II has a true 4 channels input mixer. Included is a tone generator and a slate microphone. STELLADAT II records and plays at 44.1kHz and 48kHz (on option at 96kHz) as well as ±0,1 % to meet the requirements of NTSC video. The left side panel of STELLADAT II has four mic/line inputs and the analog four line outputs as well as the monitoring section with MS controls and headphone connector. The right side panel has two digital AES/EBU XLR in- and outputs as well as optical in and out connectors for SPDIF digital signals. This panel also contains the XLR and Lemo Time Code in and out connectors. STELLADAT II has an LCD screen allowing a great range of information to be displayed. In particular, signal levels can be controlled to a very high degree of precision due to the high resolution image. An LCD display, because of its transflective nature is visible in high ambient light. Back lighting is provided for low light situations. The Tape/Direct, User Prog and Display keys are located to the right of the main level potentiometers, so all controls are grouped. The Tape Transport buttons are high quality positive detent switches with a special molded rubber cover. On the top panel, the tape transport is located on the right of the four-input mixer. The menu selection is handled with a simple joystick. 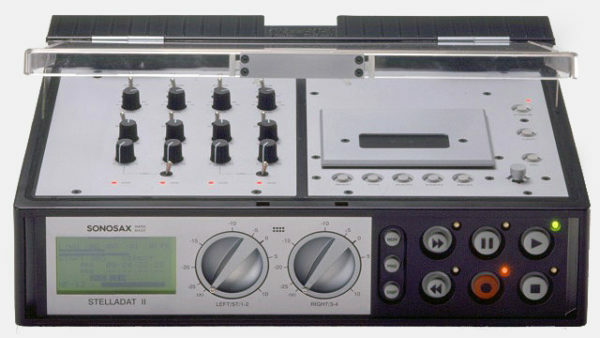 For studio use, the tape transport keys are replicated on the top of the recorder or can be assigned with many useful functions. The battery housing is located on the back panel of STELLADAT II. On its side resides a small control loudspeaker. While many Time Code DAT machines have become notorious for frequency instability, (Time Code drift of 20 ppm is typical), STELLADAT II is as stable as its Swiss analog predecessors. (Time Code drift typically less than 2 ppm) and is offered with an optional High Stability (oven stabilized) crystal which will provide frequency stability < 0.2 ppm. STELLADAT II has been designed and manufactured to meet the highest standards of reliability to operate under very rugged conditions. If service should be required its modular design allows any module to be exchanged with one single 2 mm hex wrench.